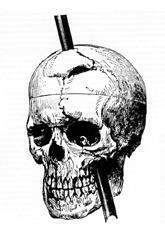 In September 1848, Phineas Gage was working as a foreman of a crew cutting a railroad bed in Cavendish, Vermont. He was 25 years old. It was on September 13, when he was using a tamping iron to pack explosive power into a hole when the powder detonated. The tempting iron, that was 43 inches (3 feet 7 inches) long, 1.25 inches in diameter and weighing 13.50 pounds, shot upwards and penetrated point first through Gage’s left cheek. It ripped into his brain and exited through his skull. The tamping iron landed about 25 yards away from him. Although this may have taken Gage’s sight from his left eye, he might not have lost consciousness. He was taken to be treated by Doctor John Martyn Harlow. John Harlow treated Gage for months after the accident and made observations about Gage’s health and behaviors. He state,d that the balance between his “intellectual faculties and animal propensities” seemed gone. He could no longer stick to plans, uttered profanity and showed little deference for his fellows. Gage’s friends found him to be “no longer Gage,” after the accident. After being refused his former job as a foreman, he went to work in a stable in New Hampshire, drove coaches in Chile, until he eventually joined relatives in San Francisco. This is where he died 12 years after the accident, in May 1860, at the age of 36, after a series of epileptic seizures. 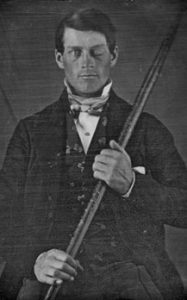 Phineas Gage became one of the most famous patients in the area of neuroscience because his case was the first to suggest a link between brain trauma and personality changes. Neurons: How do they work?